Last month the commercial real estate company Menlo Equities started to sell condos in Metropolitan condominium on 19503 Stevens Creek Boulevard in Cupertino. Today, despite the first fall rain in Bay Area, there were plenty of cars parked in front of sales office. The Metropolitan Cupertino conveniently located within walking distance to Vallco Fashion Park and almost completed Cupertino AMC Theaters. The 7.74 acre parcel includes two existing commercial buildings. The condominium includes two mixed-use buildings with 6,386 SF of retail space and 107 residential units. The parking is located below building. Amenities include a small pool (5ft deep) and children's play areas. The condos priced as following one bedroom from $500K, two bedrooms from $600K and three bedrooms from $700K. The HOA (Homeowners Association Fees) set as $320-$350 per month. I would expect that HOA would cover hot water, but every condo has own water heater, so add a little bit to homeowner expenses. As you see from the picture above there is the huge parking lot on the east side of complex. The Vallco shopping center has the plan to build instead the six level parking structure with 1154 stall and some retail building, but no building permits were issued yet. 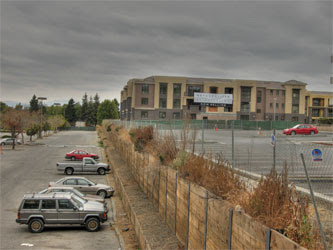 In April of 2006 Apple company announced that iPhone inventor bought 50 acres parcel in Cupertino using third party real estate agent and will build new offices for as many as 3,500 employees, look at the possible traffic issues for condo owners. According to Cupertino Union School District and Fremont Union High School District the home address of Metropolitan Cupertino assigned to the following schools: Sedgwick Elementary school (API 876), Hyde middle school (API 828) and Cupertino high school (API 834).